Go to File => Open. Then select an image file to open. Once your picture is opened, select the icon A from Toolbox window. 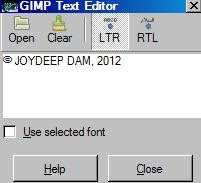 Alternatively you can go to GIMP main window => Tools => Text. Now click on the image where you want to have your copyright text. A small window (GIMP Text Editor) will open where you will write your copyright text. Alternatively, you can press Open and browse to the text file which contains your text. You can also select the option "Use Selected Font", which will show your text in that font inside the editor. Press "close" once you are done. Now go to the Layer window. You will see that currently you will have only two layers, the picture and the copyright text. Select the copyright text layer. You will see that this layer mode currently set to Normal and opacity value is set to 100.0 as shown below. This opacity value determines how much transparency you will have with your text. Now you guessed right! The lower the value of Opacity higher is transparency of the text. So now if you want to make your text like watermark, you need to lower the opacity value. Next right click on the copyright text layer in layer window and do "Merge Down". In that way your text layer will no longer be separated but merged with image. Finally save the copyright image with different name so that you will not loose the original file. Follow above steps also if you like to insert an image as copyright on top of another image. 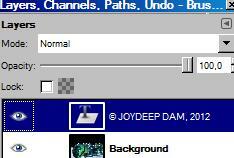 Do you know or have any other experience on how to create a watermark using GIMP? Please feel free to share here.